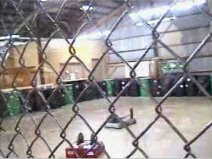 All the Village Idiot wins from the December 2002 NCRSF event, set to the music of Crystal Method's "Name of the Game". 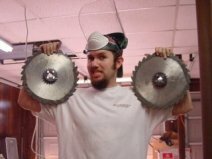 Village Idiot was fortunate enough to win first place in it's weight class, and take home the middleweight trophy! I kept having images of a video stuck in my head every time I heard my favorite song, "Damage INC" by Metallica. Finally, I gave in and edited my first video to music deal that I call "Idiot INC". This is the first Village Idiot fight I was able to tape! 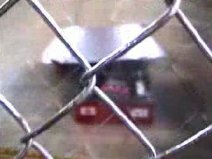 For obvious reasons, BattleBots will not allow personal cameras to tape fights at BattleBots events. 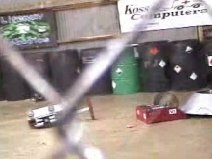 This footage is from my first fight at the North Carolina Robot Street Fight (NCRSF) that I attended in July 2001 against "Evil Con Carne". ECC is a really cool bot build by a friend, Terry Talton. I feel like this was my closest fight to date, Terry got some good whacks in with ECC! The fight eventually ended in my favor by KO. Another fight from the NCRSF I attended in July, 2001. I was fortunate that the first hit derailed his chain that spun up the robots weapon. Look for good things to come from MAIM in the future, Chuck and his crew ROCKED! This fight also ended in my favor by KO. Yet another fight from the NCRSF from July, 2001. This fight was against Ron Woodward's "Category 3". Ron was a cool guy, but I didn't really get a chance to talk to him much. He wasn't very close to my location in the pits, but what little we did talk he came across as a super nice guy. This fight ended by KO in VI's favor. Village Idiot's last one on one fight (for the MW championship) at the NCRSF was against Mark Harrison's "Two Fisted". This fight ended in a KO with VI as the victor for the NCRSF Middleweight championship... Yay! 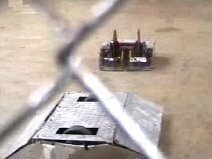 Every middleweight robot that could still move was placed in the arena and the NCRSF ended with a bang! 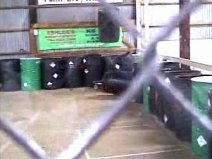 You will need Microsoft Media Player to view any of the video footage on this website. Download the latest version here! � 2001 RV. All rights reserved.